The cast of Qui Nguyen’s critically-acclaimed new play Vietgone– Raymond Lee, Paco Tolson, Samantha Quan, Jon Hoche and Jennifer Ikeda – were on fire last night at Manhattan Theatre Club. Nguyen is the co-founder of the OBIE Award-winning Vampire Cowboys Theatre Company of NYC and is often credited as a pioneer of “geek theatre”. 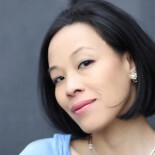 Helmed by May Adrales, Nguyen’s award-winning Vietgone is currently having its New York premiere at MTC at New York City Center – Stage I (131 West 55th Street). Click here for tickets. Vietgone is produced in association with South Coast Repertory and was originally commissioned and developed by South Coast Repertory as part of SCRCrossRoads, with funding from the Time Warner Foundation. It is a recipient of the Edgerton Foundation New American Play Award and the winner of the 2015 Harold and Mimi Steinberg/American Theatre Critics Association New Play Award recognizing playwrights for scripts that premiered professionally outside New York City during 2014. Innovative, fresh and visually appealing, Nguyen’s singular voice and vision is on display with Vietgone, a modern twist on the All-American love story, borrowing elements from the world of up-to-the-minute popular culture to recreate the playwright’s own parents’ meeting, ranging from hilarity to heart-wrenching drama. It’s the classic story of boy meets girl – except this boy and girl are refugees from the Vietnam War newly settled in a relocation camp inside Middle America. The creative team for Vietgone features Tim Mackabee (scenic design), Anthony Tran (costume design), Justin Townsend (lighting design), Shane Rettig (original music and sound design), and Jared Mezzocchi (projection design). This entry was posted on November 5, 2016 by Lia Chang in Asian American Artists, Entertainment, New York, Theater and tagged Backstage Pass with Lia Chang, Jennifer Ikeda, Jon Hoche, Lia Chang, May Adrales, MTC, Paco Tolson, Qui Nguyen, Raymond Lee, Samantha Quan, Vietgone.